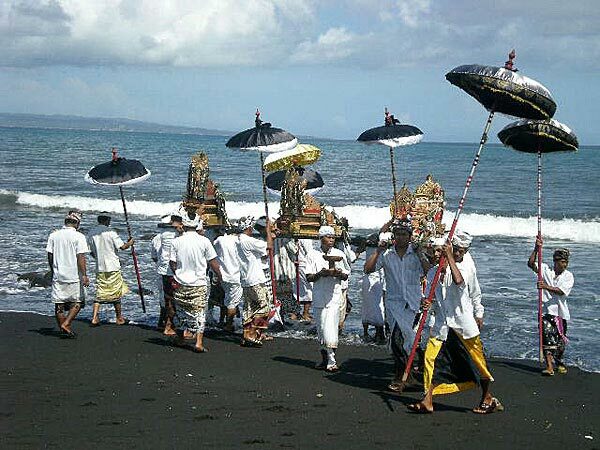 Melasti or Melis: 3-6 days (depending on each village) before Nyepi all the symbols of the personalities of the gods are carried in procession to the ocean, lake or spring for purification or cleansing before to celebrating the New Year. after cleansing they reside at the main temple until Ngerupuk Day (OgohOgoh). Tawur Kesanga: balancing ritual and animal sacrifice is offered at the cross roads in each village. The philosophy is to harmonize the micro-cosmos with the macro-cosmos, neutralizing negative energy. The cross road symbolizes a vertical and horizontal meeting for humans with god, humans with animals and humans with plants. In the center, where the heart is – this where the balance begins. Ngerupuk — OgohOgoh day from morning until midnight: The youth gather all day with gamelan and finishing the final touches on the huge OgohOgoh statues, made from bamboo, woven matting, paper-mache, and sponge. 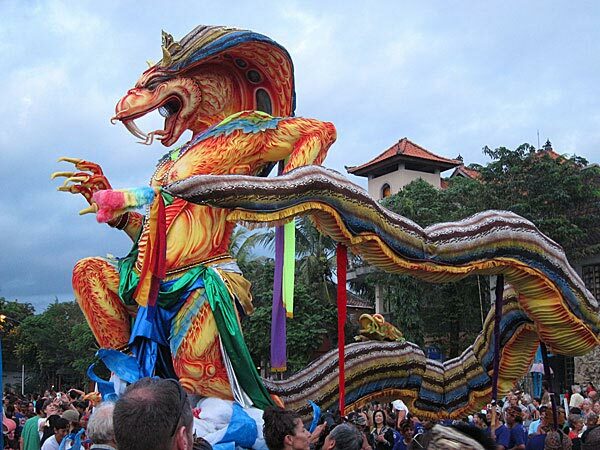 In the shapes of monsters, or scary negative symbols they are carried by young men with lots of noise and gamelan and dancing and fire works to the center of each village. In front of ogoh –ogoh the young women bring obor. 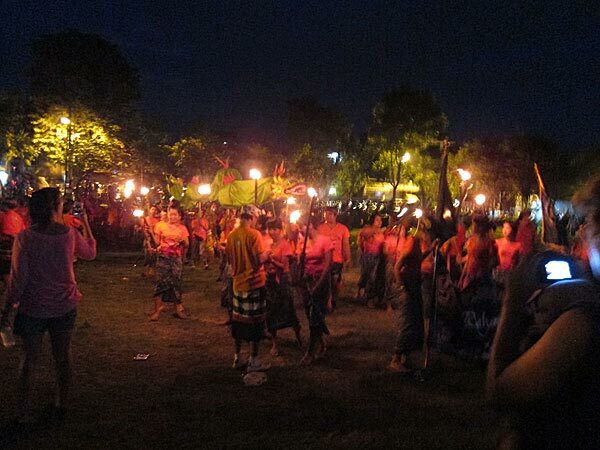 Obor is a big burning torch made from bamboo and resin and coconut skin which lights the procession in the darkness until midnight. 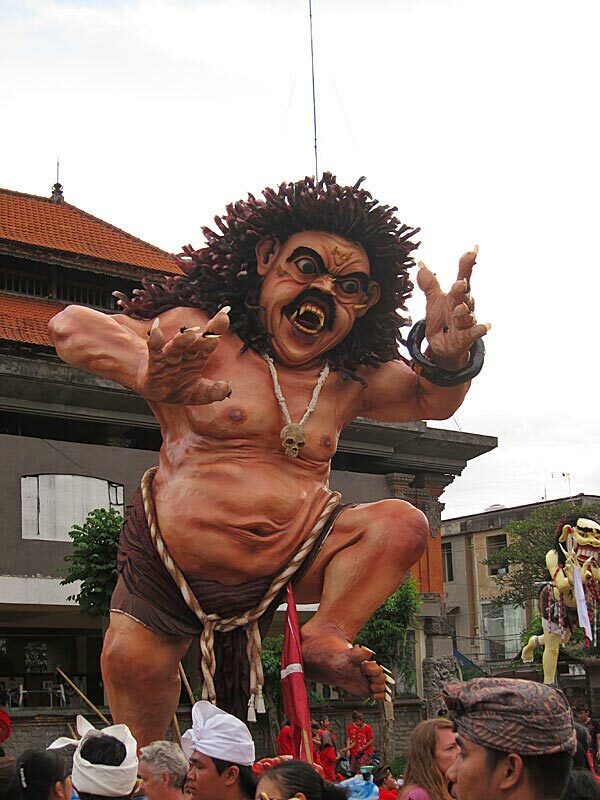 Ngembak Geni — day after Nyepi : Bali comes back normal again, so most Balinese visit family or tour someplace new.